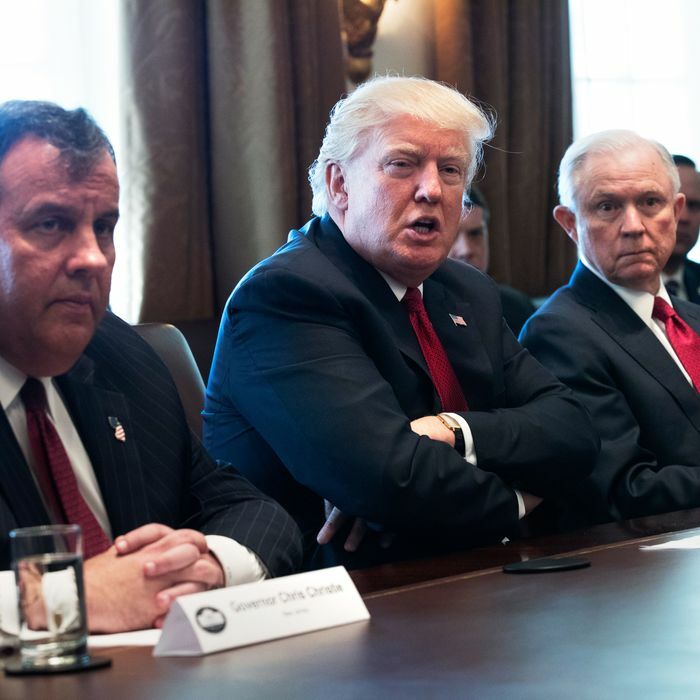 On Tuesday afternoon, President Trump attended a briefing, held at his New Jersey golf club, on the ever-worsening opioid crisis in the U.S., which is killing nearly 150 people every day. He emerged from the briefing with two ideas for combating the epidemic: Telling young people that opioids are bad and strengthening the war on drugs. Trump’s wordier version of Nancy Reagan’s failed “Just say no” program would target those who haven’t fallen victim to opioid addiction. But what does Trump want to do for those who are already ensnared? Lean on law enforcement, he said. Trump’s law-and-order approach to solving the opioid problem is at odds with the experts’, who say focusing on the demand side of the epidemic, not the supply side, is the key to saving lives. It’s also at odds with the recommendations of his own bipartisan opioid commission, led by New Jersey governor Chris Christie. In an initial preliminary report issued last week, the commission focused on treatment, calling on Trump to make it easier for Medicaid to pay for treatment programs and to equip police officers with naloxone, a lifesaving anti-overdose medication. The commission’s primary suggestion was to have the government declare a national emergency, which would make federal funds more available to those fighting the opioid epidemic on the ground. Price said Tuesday that the recommendation would not be heeded. “We believe that, at this point, the resources that we need or the focus that we need to bring to bear to the opioid crisis, at this point, can be addressed without the declaration of an emergency,” he said. After a campaign full of promises to solve the opioid crisis, denying his own commission’s top suggestion is Trump’s most obvious middle finger to those who believed he would attack the problem. But it’s not the first one. More significantly, he backed every Medicaid-slashing health-care proposal to emerge in the GOP-controlled Congress as Republicans desperately tried to repeal and replace the ACA. If they became law, these bills would have stripped resources from treatment facilities and worsened problems for the 1.2 million people with substance-abuse issues who get insurance through the ACA’s health-care expansion. So, while it seems Trump has done nothing to follow through on his promise to help communities ravaged by drugs, that’s not entirely true. By failing spectacularly in his role as deal-maker-in-chief and whiffing on his promise to repeal Obamacare, Trump ensured the continued treatment for Americans benefitting from his predecessor’s signature achievement.